Helping children explore a life of faith is an important part of our efforts to foster the growth and development of well-rounded, responsible and caring students. Christian faith is basically defined as a secure belief in God and a trusting acceptance of God’s will. Teaching faith instills a set of principles and values in children in order that they can grow into honorable adults. The same principles apply for every religion and ethnic background, so having faith is universal in spirit. With faith, we have hope, and the certainty that all things are indeed possible. At St. John’s religious instruction and formation takes place in the classroom, the chapel, and in our shared life together. 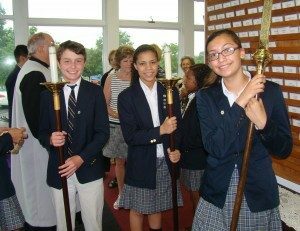 A chapel service is held each week for grades K-8. In the Lower School (grades K-4) receive classroom instruction once per week. In fifth grade, our goal is to increase our knowledge of Jesus and His Church and how it has developed in sign, symbol, and community. We explore The Bible, Prayer, the Sacraments, the shape of the liturgy (worship service), the resources used in worship, and the seasons and celebrations of the Church year. In sixth grade, our goal is to deepen our knowledge of the Old Testament/Hebrew Scriptures so that we better understand the roots of our faith. We explore key people and Old Testament stories, with an emphasis on The Prophets and Psalms, so that we can appreciate Jesus as the fulfillment of God’s covenant with His people. In seventh grade, our goal is to understand the meaning of Jesus’ life, death, resurrection, and the times during which Jesus lived. We explore the New Testament, with emphasis on the Sacraments of Baptism and Holy Communion/Eucharist, the Parables of Jesus, Creeds of The Church, and the Life of Paul. Students will also shape a personal creed. In eighth grade, our goal is to understand the variety of faith expressions found in World Religions. We explore a survey of the major world religions, with a focus on how they relate, compare and contrast to Christianity. Our work together is meant to foster an understanding and respect of world cultures and engender a deeper understanding of the Christian faith as well.